Ask fellow campers about "Ozarks National Scenic Riverways, Big Springs Campground NPS" and nearby attractions. This is part of the national park system. I had called the rangers to see if their campground could take a big rig and they said it could. However, the drive in there has a number of big hills and in fact, we didn't hook up with our tow when leaving, until we got out to the Freeway. The Big Springs is really worth seeing. Very stunning. 288 million gallons of spring water come out of the ground each day. However, from the campground you will not be near the Springs, or able to see the river nearby. They also didn't tell us that the largest campground area was closed off for the season and we had to go into the smaller area. We were able to find space for a 42 foot rig and got satellite reception also. Verizon signal very weak. We could get more calls but no digital service and could not go online. We wouldn't camp here again, just because the drive in is a little hairy. We camped at Ozarks National Scenic Riverways, Big Springs Campground NPS in a Motorhome. Big Springs National Park is built around Big Springs, one of the largest springs in the US. It merges with the Current River in SE Missouri. Pros: Shady sites. -A tree limb fell during the night in a storm and park rangers were there to clean it up within 1/2 an hour. Big Springs. Viewing the spring itself was very nice. Heritage Days. On a Fri. and Sat. in June, relieve the past and see candle making, soap making, blacksmiths, bluegrass, etc. Quiet. The park is about 4 miles from the nearest busy highway, so you get lots of peace and quiet. Cons: Only one loop (about 28 sites) is electric and none of the sites have water hookups. You must fill your tanks before coming into the park or before getting to your site. Water spigots (2) are available in each loop. Tent/walk-in camping loops are in the open with a LOT of sun, very hot in the summer. Shower houses are very inconveniently located and spaced very far apart. No matter what loop you camp in, you are in for a hike to the bathhouse..either that or take your car. Showers were terrible. Went from freezing cold to scalding hot in seconds and then back again. Water pressure was extremely high and shower heads were immovable so that water went wherever it wanted. Bathrooms were never clean. If you need a park ranger for information/maps/etc, don't look at the Ranger Station. Instead, check out the Camp Host in site 201 in loop 2. At any given time there were 4-5 of them sitting in chairs there all day long. NO swimming beach. Seriously? The park is built around the Current River and they have no access for swimming to the river itself? Yes, I am serious. Unless you plan on hiking a country mile through the forest, bugs, and weeds, find somewhere else to swim. All camping sites had some kind of standing water in them. I'm sure when it has been dry for awhile, this won't be a problem (when we where there, it rained). Unless you bring your own boat/tube, there is not much to do at this park. There is no river service available to rent a canoe/tube, no swimming beach access, no educational center to visit, not much of a playground. Certainly, this is not the worst campground we have ever stayed in. But it doesn't rank up in the top either. If you are looking to get away from it all, do nothing but relax and nap, and don't mind primitive camping, than this park will fill the bill. It was just myself and my toddler camping here because we wanted to attend Heritage Days. That and viewing the river were the only highlights of our stay. Roads had been washed out from a recent flood, and though navigable, were in poor condition. No help in the form of information from rangers either. 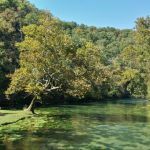 We camped at Ozarks National Scenic Riverways, Big Springs Campground NPS in a Motorhome. Are you affiliated with Ozarks National Scenic Riverways, Big Springs Campground NPS ?